With spring drawing slowly nearer, the editors are pleased to publish a new issue of Contemporary Church History Quarterly. This issue contains an eclectic mix of book reviews, article notes, and conference reports assessing new research in German and European religious history. 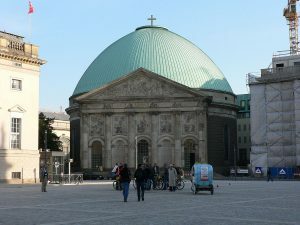 St. Hedwig’s Cathedral, Berlin, where Bernhard Lichtenberg was provost. Lichtenberg aided Catholics of Jewish descent during the Nazi era, and spoke out against the persecution of the Jews after the Kristallnacht Pogrom. Lauren Faulkner Rossi reviews Martin Röw’s substantial study of Catholic military chaplains, while Manfred Gailus examines Thomas Martin Schneider’s book on the Confessing Church’s Barmen Declaration and its longer-term impact. Dirk Schuster assesses Elizabeth Lorenz’s book on the German Christian attempt to create a nazified translation of the Bible and Andrew Chandler reviews an interesting edited volume on the British military chaplain Geoffrey Studdert Kennedy. Finally, Griech-Polelle and Matthew Hockenos supply conference reports from the Powell-Heller Conference for Holocaust Education at Pacific Lutheran University and from the German Studies Association, informing us about papers which consider the role of Catholicism in the Holocaust and interactions between international Protestants during the Nazi period. We hope you continue to find Contemporary Church History Quarterly a useful addition to your reading about the history of religion in Germany and Europe.